In 1952, the U.S. Army identified a requirement for a new helicopter to serve as medical evacuation (MEDEVAC), instrument trainer, and general utility aircraft. The Army determined that current helicopters were too large, underpowered, or too complex to maintain easily. In November 1953, revised military requirements were submitted to the Department of the Army. Twenty companies submitted designs in their bid for the contract, including Bell Helicopter with the Model 204 and Kaman Aircraft with a turbine-powered version of the H-43. On 23 February 1955, the Army announced its decision, selecting Bell to build three copies of the Model 204 for evaluation with the designation XH-40. Powered by a prototype Lycoming YT53-L-1 (LTC1B-1) engine producing 700 shp (520 kW), the XH-40 first flew on 20 October 1956 at Fort Worth, Texas, with Bell’s chief test pilot, Floyd Carlson, at the controls. Two more prototypes were built in 1957, and the Army had previously ordered six YH-40 service test aircraft, even before the first prototype had flown. In March 1960, the Army awarded Bell a production contract for 100 aircraft, which was designated as the HU-1A and officially named Iroquois after the Native American nations. The helicopter quickly developed a nickname derived from its designation of HU-1, which came to be pronounced as “Huey”. The reference became so popular that Bell began casting the name on the helicopter’s anti-torque pedals. The official U.S. Army name was almost never used in practice. After September 1962, the designation for all models was changed to UH-1 under a unified Department of Defense (DOD) designation system, but the nickname remained. While glowing in praise for the helicopter’s advances over piston-engined helicopters, the Army reports from the service tests of the YH-40 found it to be underpowered with the production T53-L-1A powerplant producing a maximum continuous 770 shaft horsepower (570 kilowatts). [N 1] The Army indicated the need for improved follow-on models even as the first UH-1As were being delivered. In response, Bell proposed the UH-1B, equipped with the Lycoming T53-L-5 engine producing 960 shp (720 kW) and a longer cabin that could accommodate either seven passengers or four stretchers and a medical attendant. Army testing of the UH-1B started in November 1960, with the first production aircraft delivered in March 1961. Bell commenced development of the UH-1C in 1960 in order to correct aerodynamic deficiencies of the armed UH-1B. Bell fitted the UH-1C with a 1,100 shp (820 kW) T53-L-11 engine to provide the power needed to lift all weapons systems in use or under development. The Army would eventually refit all UH-1B aircraft with the same engine. A new rotor system was developed for the UH-1C to allow higher air speeds and reduce the incidence of retreating blade stall during diving engagements. The improved rotor resulted in better maneuverability and a slight speed increase. The increased power and a larger diameter rotor required Bell’s engineers to design a new tail boom for the UH-1C. The longer tail boom incorporated a wider chord vertical fin on the tail rotor pylon and larger synchronized elevators. While earlier “short-body” Hueys were a success, the Army wanted a version that could carry more troops. Bell’s solution was to stretch the HU-1B fuselage by 41 in (104 cm) and use the extra space to fit four seats next to the transmission, facing out. Seating capacity increased to 15, including crew. The enlarged cabin could also accommodate six stretchers and a medic, two more than the earlier models. In place of the earlier model’s sliding side doors with a single window, larger doors were fitted which had two windows, plus a small hinged panel with an optional window, providing enhanced access to the cabin. The doors and hinged panels were quickly removable, allowing the Huey to be flown in a “doors off” configuration. The United States Air Force’s (USAF) competition for a helicopter to be used for support on missile bases included a specific requirement to mandate the use of the General Electric T58 turboshaft as a powerplant. The Air Force had a large inventory of these engines on hand for its fleet of HH-3 Jolly Green Giant rescue helicopters and using the same engine for both helicopters would save costs. In response, Bell proposed an upgraded version of the 204B with the T58 engine. Because the T58 output shaft is at the rear, and was thus mounted in front of the transmission on the HH-3, it had to have a separate offset gearbox (SDG or speed decreaser gearbox) at the rear, and shafting to couple to the UH-1 transmission. The single–engine UH-1 variants were followed by the twin-engine UH-1N Twin Huey and years later the UH-1Y Venom. Bell began development of the UH-1N for Canada in 1968. It changed to the more powerful Pratt & Whitney Canada PT6T twin-engine set. The U.S. also ordered the helicopter with the U.S. Air Force receiving it in 1970. Canada’s military, the U.S. Marine Corps, and the U.S. Navy first received the model in 1971. In 1996, the USMC began the H-1 upgrade program by awarding a contract to Bell Helicopter for developing the improved UH-1Y and AH-1Zs variants. The UH-1Y includes a lengthened cabin, four-blade rotor, and two more powerful GE T700 engines. The UH-1Y entered service with the USMC in 2008. All aircraft in the UH-1 family have similar construction. The UH-1H is the most-produced version, and is representative of all types. The main structure consists of two longitudinal main beams that run under the passenger cabin to the nose and back to the tail boom attachment point. The main beams are separated by transverse bulkheads and provide the supporting structure for the cabin, landing gear, under-floor fuel tanks, transmission, engine and tail boom. The main beams are joined at the lift beam, a short aluminum girder structure that is attached to the transmission via a lift link on the top and the cargo hook on the bottom and is located at the aircraft’s center of gravity. The lift beams were changed to steel later in the UH-1H’s life, due to cracking on high-time airframes. The semi-monocoque tail boom attaches to the fuselage with four bolts. The UH-1H’s dynamic components include the engine, transmission, rotor mast, main rotor blades, tail rotor driveshaft, and the 42-degree and 90-degree gearboxes. The transmission is of a planetary type and reduces the engine’s output to 324 rpm at the main rotor. The two-bladed, semi-rigid rotor design, with pre-coned and underslung blades, is a development of early Bell model designs, such as the Bell 47 with which it shares common design features, including a dampened stabilizer bar. The two-bladed system reduces storage space required for the aircraft, but at a cost of higher vibration levels. The two-bladed design is also responsible for the characteristic ‘Huey thump’ when the aircraft is in flight, which is particularly evident during descent and in turning flight. The tail rotor is driven from the main transmission, via the two directional gearboxes which provide a tail rotor speed approximately six times that of the main rotor to increase tail rotor effectiveness. The UH-1H’s dual controls are conventional for a helicopter and consist of a single hydraulic system boosting the cyclic stick, collective lever and anti-torque pedals. The collective levers have integral throttles, although these are not used to control rotor rpm, which is automatically governed, but are used for starting and shutting down the engine. The cyclic and collective control the main rotor pitch through torque tube linkages to the swash plate, while the anti-torque pedals change the pitch of the tail rotor via a tensioned cable arrangement. Some UH-1Hs have been modified to replace the tail rotor control cables with torque tubes similar to the UH-1N Twin Huey. 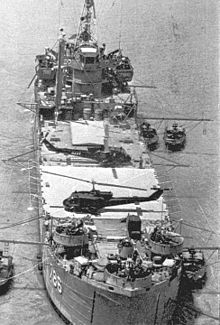 Four years after the disestablishment of HA(L)-3, the Navy determined that it still had a need for gunships, establishing two new Naval Reserve Helicopter Attack (Light) Squadrons as part of the newly formed Commander, Helicopter Wing Reserve (COMHELWINGRES) in 1976. Helicopter Attack Squadron (Light) Five (HA(L)-5), nicknamed the “Blue Hawks”, was established at Naval Air Station Point Mugu, California on the 11 June 1977 and its sister squadron, Helicopter Attack Squadron (Light) Four (HA(L)-4), known as the Red Wolves, was formed at Naval Air Station Norfolk, Virginia on 1 July 1976. NASA’s UH-1H returns to Langley after supporting space shuttle operations at Kennedy Space Center.